Another cool RC heli topic to cover - collective pitch (CP) and how it differs from fixed pitch (FP). Pros & cons of both, and most importantly, why you might consider one over the other. By the way, to make CP sound even more exciting than it already is, unscrupulous marketing uses the term 3D to describe CP helicopters. This is technically incorrect. 3D is a flying style, not a helicopter type! Collective Pitch Heli Flying Inverted - Something A Fixed Pitched Heli Can't Do. Before going any further, do you have a fairly good understanding what rotor blade pitch is, and how it relates to lift on all helicopters? If not, you may want to check out the page I have on lift as it will give you all the basics you need to understand the topics on this page. Fixed Pitch (FP) is exactly that. The pitch of the main rotor blades are held at a fixed or constant angle of attack. You control the amount of lift to your helicopter by simply varying the speed of the engine/motor. If you increase the speed of the motor, the rotor blades turn faster and produce more lift. The reverse happens when you lower the speed of the motor. This is a very simple means of controlling the amount of lift to your RC helicopter and if you just want a very simple and inexpensive model heli, this method of controlling lift does work. Parts count is also down substantially on FP helicopters. These are the main reasons fixed pitch is generally what most people start out with. Simplicity and cost! Fixed pitch helis are also generally more stable in a hover (in no wind) due to the shape of the high lift rotors and the lower speed in which they spin. "Object's in motion tend to stay in motion, and objects at rest tend to stay at rest". First off, motors and/or engines, can't just speed up and slow down instantaneously when you give them a command to do so. There is inertia to overcome. The mass of the rotor blades and rotor mechanism compound this problem as the engine or electric motor has to overcome the inertia to get the rotor spinning faster or the kinetic energy stored in the rotor assembly to slow it down. In other words, that's why there are no fairly large fixed pitch RC helicopters out there anymore. In my early nitro heli days, 30 size fixed pitch nitro helis were actually fairly common. They were a bear to hold at a fixed altitude because you were always behind what the heli was doing due to the rotor RPM speed change delays and tail blow out would happen any time you had to give a large speed correction to the rotors (why I chose collective pitch to start on). Most if not all fixed pitch helis now are micro size and as a result of much less heli and blade mass, fixed pitch can work quite well with these little rascals. The Blade 120S or Esky F150 are two good examples. Fixed pitch in other words works fairly well up to RC helicopters that have main rotor diameters up to about 12 inches (300mm) or so. After that, the rotor and helicopter mass starts getting to be too much, and fine lift control is lost because of the delay in rotor speed changes. Tail blow out tendencies (where the tail rotor loses its fight against the main rotor torque) also starts to become a big problem on fixed pitch birds this size and larger. The torque spikes are not only greater, but so is the severity in how much they change every time you adjust the speed of the rotors to control your lift. This all adds up to a very hard working tail rotor that is being pushed to the extremes to hopefully keep the heli from yawing. 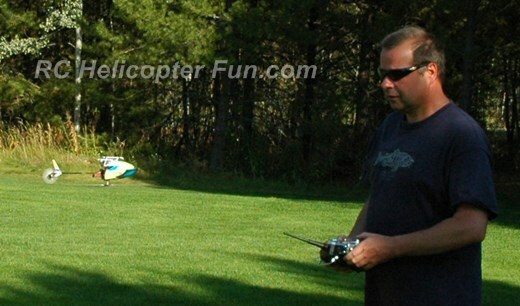 Poor wind handling immunity is another limitation with fixed pitch RC helicopters. Most fixed pitch helis have a very hard time when the wind picks up because the rotor speed is so slow compared to collective pitch helicopters. This can result in being lofted up high in the air when even a small gust of wind hits your bird. Slow and changing rotor speed can also give poor cyclic performance. With collective pitch (CP), the pitch or angle of attack of the main rotor blades changes to control lift while the motor/engine speed and rotor speed stays more or less constant. This time when you want to gain altitude, you increase the collective angle of the rotor blades, and your helicopter starts lifting almost instantaneously with no lag time. To stop the rate of climb, you decrease the pitch of the rotor blades and again, the response of the helicopter is almost immediate. It takes only very small movements of the rotor blade pitch angle to achieve these instantaneous corrections and gives you very precise & immediate control of your RC helicopter's lift component. On full size and larger RC helicopters, this is the ONLY way to control lift and I can't think of one single rotor RC heli these days with a rotor diameter over 2 feet that is fixed pitch any more. With a fairly constant rotor RPM, cyclic control is also much more consistent and the heli doesn't suffer from changing torque spikes as much meaning the tail rotor doesn't have to work as hard and is much less likely to blow out. CP rotor RPM is higher than with fixed pitch and as I mentioned, that gives much better wind handling immunity not to mention much faster flight performance. The other big benefit with CP is it allows inverted flying by allowing the pilot to produce negative pitch while upside down, thereby still creating positive lift. I go over how this works in the lift section. Here's a video I made that goes over how inverted flight is accomplished thanks to collective. There are of course a few downsides to CP, the main two being the increase in cost and mechanical complexity. That said, some of today's micro collective pitch helicopters are actually not that much more expensive than what some fixed pitched birds cost. The Blade Nano CP S is one such example. Collective pitch heli setup is another complexity and one of the main reasons many beginners new to the hobby start out on fixed pitch because you don't have to learn nearly as much. The other main downside is collective pitch is harder to learn how to fly because all CP heli's are unstable while hovering. Once flying fast however, they are solid as a rock. My page titled Are RC Helicopters Hard To Fly covers this in much more detail and is well worth taking a peek at if you really want to understand the differences between how FP & CP helicopters behave. Fixed Pitch is almost exclusively found on small micro helicopters these days. FP costs less than CP. FP is best suited to beginners who just want to try flying an RC helicopter to find out if they will even enjoy the hobby. FP will get boring for most people. There are certainly performance limitations, but as a first introduction to RC helicopters, fixed pitch is a viable & workable option. It's what full size helicopters use. CP gives the RC helicopter pilot the ability to fly not only faster and in greater control, but also allow inverted flight. CP has the ability to fly in much windier conditions. CP has a longer learning curve, but it rarely gets boring!